For some reason I never manage to buy pretty things for my apartment. I look at them, I lust over them, but I always feel like I should spend my hard earned dollar bills on more practical things (you know, like four million pairs of shoes). That's why this year I'm asking for pretty little things on my Christmas list. Oh, also, apparently white and metallic are having a major moment in my life right now. Love the combination of white and metallics! The round tray and serving basket set are my favorites! I was standing over those hedgehog cups in Anthro the other day trying SO hard not to buy them...they're adorable! 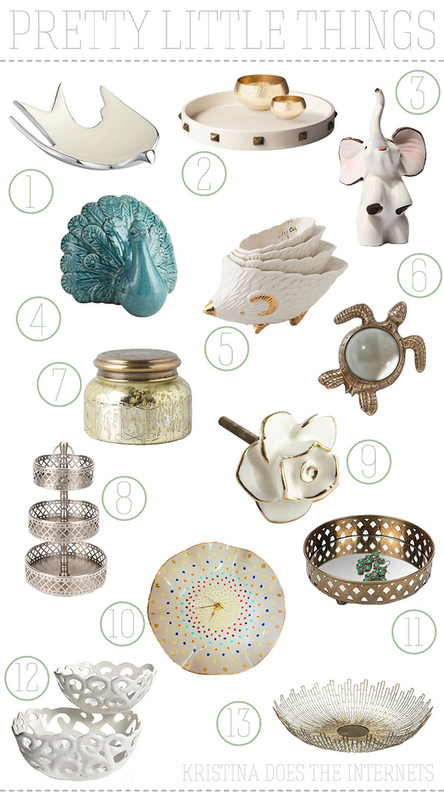 Your list is certainly filled with the prettiest little things! I love the peacock, the turtle, and the serving basket! Cute picks! Loving that Lacquer tray! I love that rose knob! What a great collection of goodies! I love the Rose Knob and the Starburst bowl. Great finds!